Atoms and molecules in the gas phase are (relatively) “simple systems in which several basic processes can be investigated [Salières12, Lépine14]. At the temporal scale of a few femtoseconds, nuclei have usually no time to move – they are “frozen” – and the system may be considered as “purely” electronic. Ultrafast dynamics can track in time the coherent oscillation of a bound electronic wavepacket in the valence or the core-shells [Goulielmakis10, Haessler10], the coherent oscillation of a dipole in an electric field [Neidel13], the transfer or “migration” of a charge carrier (electron, hole) across a molecular structure [Sansone10, Calegari14], that is one of the fundamental processes in the chemistry of life (photosynthesis involves an ultrafast charge migration in chlorophyll molecule, as vision does in rhodopsin molecule). It is now possible to describe, in real time and at its natural time scale of a few ten attoseconds, the basic process of photoemission, that is the ejection of one electron from the instantaneous absorption of one or several photons [Schultze10, Klunder11]. At the temporal scale of a few 10 to 100 fs, the nuclei start moving and drag “adiabatically” the electron cloud, according to the Born-Oppenheimer separation picture. The electronic structure evolves at the pace of the nuclear motion which thus becomes accessible in pump-probe experiment usually through electron spectroscopy [Awali14, Lietard14]. Ultrafast dynamics merges here with the vast and well established femtochemistry. Femtochemistry tracks electronic and nuclear motions in the most general chemical reaction, including nuclear rotation, vibration, dissociation, isomerization and rearrangement. In an interesting class of reactions, the nuclei move as fast as or faster than the electron cloud adapts, so that both electrons and nuclei are out of equilibrium. This “non Born-Oppenheimer” diabatic regime is of particular interest for ultrafast dynamics. Photoionization in the core- and valence shell of atoms/molecules, by a combination of XUV and laser pulses, has a central place in ultrafast studies, first, as a fundamental process which involves electronic properties of the system, and second, as an efficient probe of time-dependent system in pump-probe experiments [Miron14, Picard14, Perez-Torres14]. Electron and ion spectroscopy is thus a central technique in ATTOLAB. Momentum imaging spectrometers or “reaction microscopes” of various types are part of the gas phase endstation. They allow to perform “complete experiment”, i.e., to measure simultaneously the momenta of electrons and ions produced in the same photoionization event, in the coincidence mode [Dowek12, Billaud12, Veyrinas13]. As mentioned in Section 4.2, in the molecule-laser field interaction, the EWP recolliding with the core is scattered by the core in the two “scattering channels”, respectively the ionization and the radiative recombination channels. In both channels, the final state of the scattering, either the escaping electron or the attosecond light pulse, contains rich information on the scatterer system. In particular, in the radiative channel, atto emission extents over a large spectral range – up to keV photon energy – while keeping remarkable properties of temporal/spectral coherence. One can therefore exploit the XUV emission as a probe signal, characterizing accurately both the structural and dynamical properties of the radiating system. This provides the basis of harmonic spectroscopy [Itatani04, Boutu08, Haessler11, Diveki13, Camper15, Manschwetus15]. Time-resolved pump-probe experiments use either “trains”, i.e., a sequence of attosecond pulses separated by ~1 femtosecond, or isolated attosecond pulses, combined and perfectly synchronized with another light gradient. Several techniques for generating isolated atto pulses will be implemented in ATTOlab. Of particular interest is the “atto lighthouse” technique proposed by H. Vincenti and F. Quéré [Vincenti12, Wheeler12, Kim13]. In contrast with the usual geometry of the laser-generating medium interaction, where the atto pulses are all emitted in the direction of the laser beam, the atto lighthouse exploits a clever interaction geometry which determines emission of the successive atto pulses, respectively, in different directions of space, so that one can relatively easily pick them up one by one, and recombine them at will with variable delay [Quéré14]. [Billaud12] "Molecular frame photoemission in dissociative ionization of H2 and D2 induced by high harmonic generation femtosecond XUV pulses", P Billaud, M Géléoc, Y J Picard, K Veyrinas, J F Hergott, S Marggi Poullain, P Breger, T Ruchon, M Roulliay, F Delmotte, O Gobert, A Huetz, B Carré and D Dowek , J. Phys. B: At. Mol. Opt. Phys. 45 194013 (2012). Coherent control of attosecond emission from aligned molecules, Boutu W., Haessler S., Merdji H., Breger P., Waters G., Stankiewicz M., Frasinski L.J., Taieb R., Caillat J., Maquet A., Monchicourt P., Carré B., Salières P., Nature Physics 4, 545 (2008). 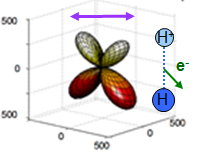 [Diveki13] "Molecular orbital tomography from multi-channel harmonic emission in N2", Z. Diveki, R. Guichard, J. Caillat, A. Camper, S. Haessler, T. Auguste, T. Ruchon, B. Carré, A. Maquet, R. Taïeb and P. Salières, Chemical Physics 414, 121 - 129 (2013). Photoionization Dynamics: Photoemission In The Molecular Frame Of Small Molecules Ionized By Linearly And Elliptically Polarized Light, D. Dowek and R.R. Lucchese, in Dynamical Processes in Atomic and Molecular Physics, eds. G Ogurtsov and D Dowek (Bussum, The Netherlands: Bentham) p 57–95 (2012) - DOI: 10.2174/97816080524551120101. [Haessler10] Attosecond imaging of molecular electronic wavepackets, S. Haessler, J. Caillat, W. Boutu, C. Giovanetti-Teixeira, T. Ruchon, T. Auguste, Z. Diveki, P. Breger, A. Maquet, B. Carré, R. Taïeb, P. Salières, Nature Physics 6, 2000 (2010). [Kim13] "Photonic streaking of attosecond pulse trains", K. Kim, C. Zhang, T. Ruchon, J. Hergott, T. Auguste, D. Villeneuve, P. Corkum and F. Quéré, Nature Photonics 7, 651 (2013). [Salières12] "Imaging orbitals with attosecond and Ångström resolutions: toward attochemistry? ", P. Salières, A. Maquet, S. Haessler, J. Caillat and R. Taïeb, Rep Prog Phys 75, 062401 (2012). "Attosecond lighthouses from plasma mirrors", J.A. Wheeler, A. Borot, S. Monchocé, H. Vincenti, A. Ricci, A. Malvache, R. Lopez-Martens and F. Quéré, Nature Photonics 6, 829-833 (2012).